Less than two months before the next Presidential elections, the Egyptian Armed Forces on 9 February launched a counter-militancy campaign called ‘Operation Sinai 2018’ to take on the Islamic State in the Sinai Peninsula but also to secure the border to Libya in the Western Desert. The operation involves increased air force sorties, the closure of the border to Gaza, several closures of roads leading to Al-Arish, shut-down of schools, increased alertness of the coastal guards and increased medical provision. While civilians cited fears of supply shortfalls, the full intensity of the counter-insurgency is yet to rear its head. The launch of ‘Operation Sinai 2018’ comes after months of low-scale activity of the Islamic-state branch in the Sinai, mostly consisting of IED attacks in and around al-Arish and Rafah. The Egyptian military responded with raids and demolitions of militant hideouts. Since November 2017 the fatality toll in the Sinai Peninsula totals up to 493, of which 311 were killed in a single disruptive attack by the Islamic State on al-Rawda Mosque in Bir el-Abd. 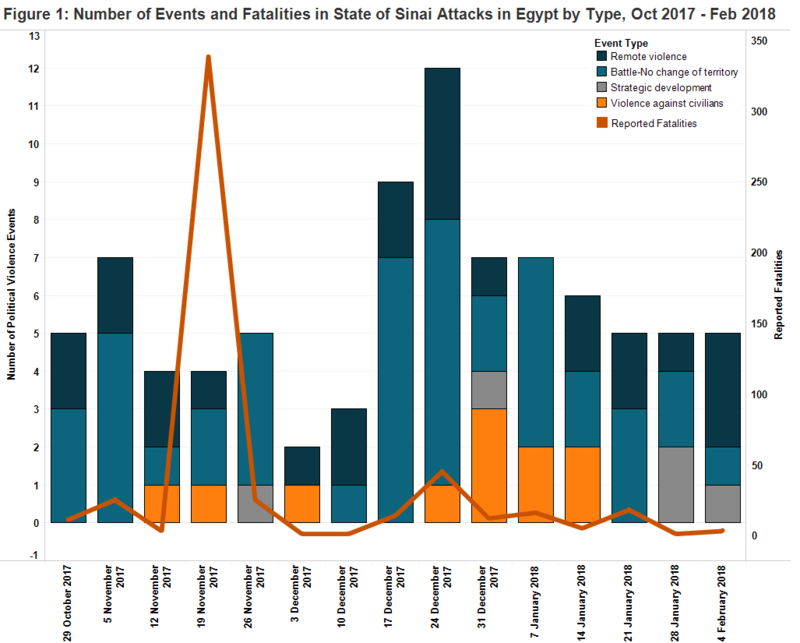 Discounting this major attack, the deadliness of the Islamic-state branch in Sinai shows a downward-trend, as the fatalities in the three preceding months (August-October 2017) amount to 277 dead. Both the Egyptian armed forces and the Islamic State attach increased importance to strategic operations. Two weeks ago, the army started to bulldoze homes and olive groves to build a buffer zone around Arish airport which is seen as providing a ‘hinterland’ for Islamic State militants. Dozens of civilians have been displaced. How susceptible this zone was for penetration by militants is exemplified by an attack in December in which the Islamic State managed to shoot down an Apache helicopter, leading to the death of two military officers, all during a visit by the Defense & Interior ministers. Similarly, the Islamic State widened its range of targets to weaken the Egyptian army’s capabilities. In November, militants initiated a missile attack on a cement factory in Jabal Libni coupled with ambushing a convoy of cement trucks. Recently, a temporary checkpoint was set up nearby Nasr Salines Company, threatening workers to stop transporting glass and salt out of al-Arish as this would serve the Egyptian regime. The company had already been targeted in August 2017, when the Islamic State-branch in Sinai dumped heads of two kidnapped workers on a square in al-Arish. Matthias Sulz is Research Assistant with ACLED. In this role, he collects, codes and analyzes data on Mauritania, Morocco, Algeria and Egypt. He is pursuing his Master's degree in International Security at Sciences Po and holds a BA degree in Political Science and in Oriental Studies from the University of Vienna. His research interests include non-state-actors across the Middle East and North Africa, military strategy, geopolitics and the dynamics of civil war violence. He is fluent in German, English, French, Arabic and Italian, and is based in Paris, France.